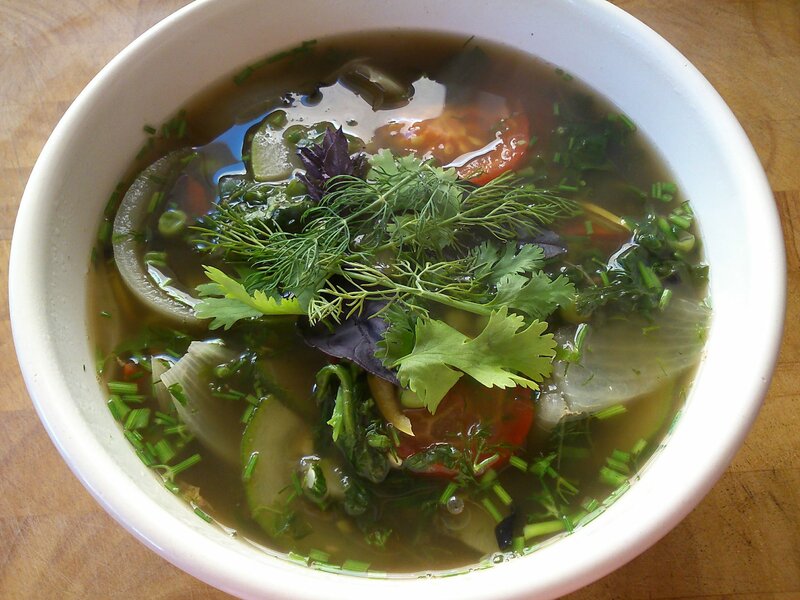 I’ve got lots of fresh herbs at the moment, and yesterday I really fancied a lovely broth, with plenty of chilli heat and vegetables. Years ago I used to make a soup inspired by Vietnamese pho, with a broth flavoured with cassia bark and ginger among other things. It just so happens that for the first time in ages I had, as well as the herbs, both ginger and cassia available, so I just had to make a version of the soup! It looks like a long list of ingredients, but half of them are for the broth, and it would be super easy to make a larger quantity so that you have some ready for another day. In fact I wish I had, I could happily eat this soup again today! First make the broth. Simmer all of the ingredients together for 20 minutes. Remove the aromatics, reserving some of the onion. I like to add about half of it back to the soup. Put the spinach and peas into the broth straight from frozen, along with the chilli. Bring to a simmer and cook for 4-5 minutes. Next add the tomato and herbs (reserving a few herb leaves to garnish) and cook for 1 minute. No longer or the tomato will go mushy. Season to taste with lime juice, tamari and white pepper. I love Vietnamese food. This soup sounds delicious, definitely going to have to make this soon!